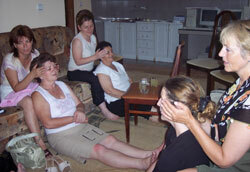 Emma (far right) leads a training session in head massage. Emma administers individual cranial-sacral therapy. Transrural's experience of working with war widows in Kosovo came to the notice of therapist Emma Stacey. Emma works in Bosnia, using cranial-sacral therapy and other types of bodywork to help women traumatised by their experiences during the war. This gentle, hands-on technique is claimed to aid the circulation of the cerebrospinal fluid which surrounds and nourishes the brain and spinal cord and to benefit the central nervous system. It is used to alleviate depression and anxiety as well as physical dysfunction. Using a light touch, practitioners can monitor the cranial-sacral rhythm at key body areas to pinpoint the source of an obstruction or stress. Once a source has been determined, they help the body heal itself by correcting the natural movement of the fluid and related soft tissue. She offered to spend ten weeks in western Kosovo to provide this therapy to widows taking part in the Kosovo programme. The idea was put to the participants and received an enthusiastic response. Perhaps the fact that the therapy is carried out fully-clothed was a plus point for our modest, head-scarved participants. The effect could be described as electric, especially as many of the women described the experience as feeling as if "a gentle electric current was passing up and down my spine"! The therapy appeared to unblock mental and physical stresses incurred during the women's traumatic time. Mentally liberated, they were able to take part in project activities with more freedom and enthusiasm. Whereas before, they had been dependent on frequent visits by the project team to maintain their interest, they now started to take things forward themselves. Numbing despair transformed into hope, humour and active engagement in future plans. Liberation was not limited just to project activities. Many of these women had not been out of their homes for years and they had become mistrustful of one another. Social pressures mean they cannot walk through village unaccompanied without attracting the attention and inviting gossip. Their lives are extremely restricted and this also placed barriers to their full participation in the project. Emma took them out on expeditions into the countryside, to enjoy fresh air and to identify and prepare appropriate medicinal plants. She offered dietary advice, particularly about drinking lots of strong coffee if they wanted to avoid insomnia. She started other activities, such as growing herbs and using beeswax and plants to make cosmetic creams and treatments. She taught them simple yoga exercises to help them breathe more deeply and feel reconnected to their bodies. They also learned how to massage one another which strengthened bonds within the community and reinstated a quality of care within the group. 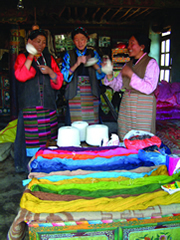 Many of the women who benefited felt able subsequently to take part in training and visits outside their villages; some even took part in a study visits to Albania. The project team learnt a valuable lesson. When working with people severely traumatised by terrible events, there can be psychological barriers to overcome before the full benefits can be realised. Sufferers become withdrawn and suspicious and therefore prevented by their own internal distress from participating and benefiting fully from opportunities offered. This experience has strengthened Transrural's capacity to work in post-disaster situations and feeds directly into the post-tsunami women's project. It is interesting to note that, while many Tsunami widows have found new partners, this is not the case in Kosovo, because it is not culturally acceptable for widows to re-marry - except to a brother-in-law. Grant funding from Irish Development Co-operation (Irish Government) and Transrural sponsors. Thanks to Emma Stacey for volunteering her time and expertise.